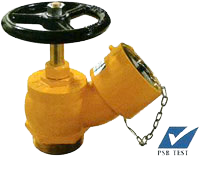 Kimty provides an one stop service from design and build, supply and installation, breeching inlet replacement, maintenance, hydrostatic testing, pump testing and certified of rising main system to QP and FSSD submission. These systems provide easy access to water for firefighting purposes at various points across multiple storeys in a building. Where portable water or chemical supplies would be impractical, wet and dry risers enable firefighters to easily access water supplied by an external pressurised source. The choice between a wet and a dry riser will depend on your building’s water pressure. If there is doubt that your building’s water pressure will be insufficient for firefighting purposes, a dry riser is preferred. Kimty provides landing valves suitable for use with both systems that are to be installed on every floor requiring riser access. An inlet breeching is the point within a dry riser system at which fire and rescue services connect their own water supply. Fire engine access is required within 18 metres of the inlet. These are to be placed somewhere easily accessible in an area that provides safety and convenient building access for firefighters. Kimty offers both two and four-way inlets enabling multiple connections and higher volumes of water to be utilised. Our range of products and services has been chosen to provide the greatest range of choice for property-owners in Singapore. Discuss your needs with our knowledgeable staff and discover how Kimty could help you ensure your building has adequate safety equipment in the event of a fire. Get in touch with our staff today and learn how we could ensure your property is prepared. Call us on +65 6255 3255 or send us a message through our enquiry form or via email at sales@kimty.sg and we’ll get back to you as soon as possible.